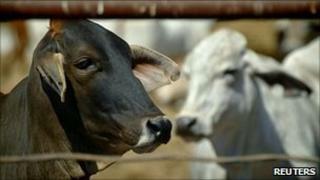 Australia has lifted a suspension on live-cattle exports to Indonesia, put in place over concerns about cruelty. Agriculture Minister Joe Ludwig said he was satisfied that the animals would not be mistreated. Australia suspended the trade a month ago when a TV documentary showed steers being whipped, beaten and slashed repeatedly in Indonesian abattoirs. Indonesia is Australia's largest live-cattle market, with exports worth more than AU$300m (£200m; $320m) a year. Indonesian officials have rebuffed claims of widespread animal cruelty in their abattoirs. Mr Ludwig said new guidelines for Australian exporters and Indonesian importers had been put in place to safeguard the animals' welfare. He said revised export control orders would require ranchers to apply for permits to demonstrate they can meet animal welfare requirements. "They require exporters to trace cattle from properties, on to vessels, into feedlots and into abattoirs that meet agreed international standards," he said. He added that the abattoirs would be "independently audited". The ban was a result of public revulsion at gruesome footage from Indonesia's abattoirs, broadcast in an ABC TV documentary. It showed animals being whipped and beaten, suffering terrible pain before being slaughtered. Australia first announced a ban on live exports to the 12 abattoirs featured in the programme. But the public demanded more, signing online petitions to halt the trade with Indonesia.